Bright Half Life at About Face Theatre directed by Kiera Fromm is an elegant exploration of queer love and the quirks of relationships. A two-person play penned by Tanya Barfield, Bright Half Life centers around the intertwined lives of two women, Erica (Elizabeth Ledo) and Vicky (Patrese D. McClain). The play jumps back and forth through time to tell us the story of Vicky and Erica’s decades long love affair, from their first encounter at the job where Vicky is the only black female supervisor, to the marriages of their children. Fromm’s direction and Barfield’s sequence of events made it clear from the beginning that this love would be complicated and messy, that it would end and perhaps begin again. But whether or not they see a happy ending almost doesn’t matter. Bright Half Life believes that it’s not about the result, it’s about the journey. 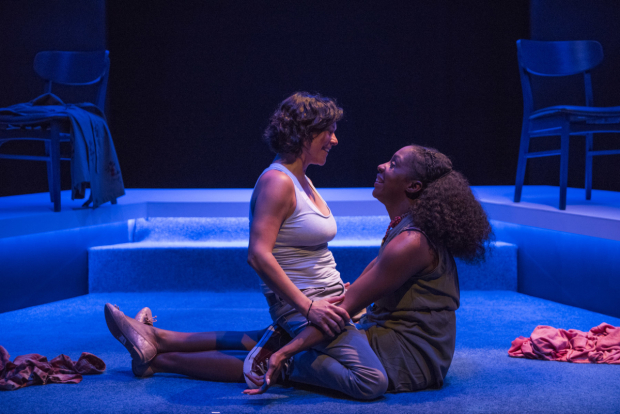 The play is non-linear, and often returns to moments from previous scenes, letting the audience discover new meanings and subtext to previously seen conversations as the new information about Vicky and Erica’s relationship comes to light. This could have been very confusing, but the design world gave the audience a clear roadmap to understanding the timelines. As they hurdled through time and space on William Boles’ angular and precise set, they only used two chairs and their bodies to set each scene, letting Christopher Kriz’s sound design guide the audience. This guidance is surprisingly subtle, you barely register the change of sound but rather sense the change of feeling. Kriz takes us from a Ferris wheel, to a hospital, to a conventional workplace, and more with a delicate clarity. The lighting, designed by Christine Binder, consisted of ethereal side light, tight spot lights, beautiful overhead panels, and was used to tighten the focus of time and space. One particularly effective device was the use of a tight spot on a single actor’s face as she said something that at first seemed jarringly out of place in the scene. Then, as she would turn to her girlfriend and continue with her thought, it became clear that those moments in the light represented the actor’s internal monologue. This action informed the rest of the scene fabulously, utilizing an age old theatrical device in a fresh new way: letting an audience in on a juicy secret that only they know. What I truly loved about this show was the simplicity of the theatrical devices used, to an ingenious extent. Melissa Ng’s costume design was effortlessly able to scale 20+ years of a lifetime without either character leaving the stage. The secret? Layering. It is easy to muddy up a production like this trying to be cool or fancy, dazzling an audience with all the tricks available in 21st century theater, but here the simplicity of the design and direction allowed these two stunning actors to shine. Actor Elizabeth Ledo as Erica comes out of the gate with such an infectious warmth that it makes you wonder how Vicky could possibly resist. Plaid-rocking Ledo is a crowd pleaser, and manages to infuse even Erica’s most infuriating moments with a helpless charm, invoking a beautifully tragic lesbian Hamlet. Patrese D. McLain has a tough job playing the graceful but reserved Vicky, but when the walls come down and we do finally see her loving tendencies, the payoff is emotionally stunning and surprisingly playful. The play focuses on the intimate dynamics that are found in many relationships. Certain arguments will feel painfully familiar, depending on your own lived experiences. After the show, each person I spoke to could point to a different moment in the play and say “my partner does that!” It’s filled with the moments that build a relationship and slowly chip it away, the overarching question occurring over and over: would you do it again? On a personal note, I must discuss the social relevance of this play for me as a queer person of color and theatre artist. The play alludes to various time periods and stretches over decades as I previously mentioned, but the reference that caught my ear was to queer life in the early 2000s. Whenever marriage is discussed it is accompanied by a necessary trip to Massachussetts (gay marriage law was passed there in 2004), which struck an important chord for me. I felt incredibly inspired seeing a woman onstage who looked like me, playing a lesbian in an interracial relationship with children, discussing the hard truths about the difficulties of understanding cultural bridges. At one point, Vicky is discussing her own racial history and having been called an “oreo” in her past – a disrespectful term intended to imply one is black on the outside, and white on the inside. Erica has to stop and realize that though she lacks privilege as a white gay woman, she doesn’t in fact understand everything about Vicky’s identity as a black woman, and asks to be taught about her whiteness. It’s a touching moment of connection onstage in a world that feels so divided. A timeless and compelling script, I recommend Bright Half Life for anyone wanting to see progressive LGBTQ+ theatre written by a black queer femme. About Face is one of the only companies where I can see queer, happy, healthy relationships portrayed without ever being the punchline or tragic figures. It is important that we get to see ourselves as the heroes and lovers, and About Face’s mission of portraying LGBTQ theatre is both necessary and commendable.